First published in Serbian as Vizilsan: Kristal plavog zeca by Darkwood in 2013. English language translation by Dejan Savic published by Europe Comics in June 2017. 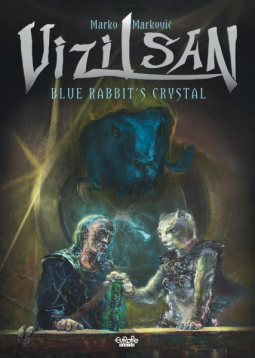 Vizilsan: Blue Rabbit's Crystal caught my attention because of the Donnie Darko style rabbit on the front cover. When I then learnt that the author, Marko Markovic, is Serbian I decided to give this graphic novel a read. It is a multi-species fantasy story with a Quest to find a mythical gem that can somehow control energy throughout the world. I think, anyway. To be honest, I did struggle to keep the storyline straight in my mind. There are flashbacks to Historical Times and, for a non-fantasy reader like me, the present day looked fairly historical too. I think readers who are more used to weirdly-named fantasy characters and species would stand a better chance of keeping up with Markovic's convoluted plot, however I am glad I gave this a try because I absolutely loved the artwork. Scenes of towns and cities are particularly stunning because of their detail. Also, I felt the images really flowed from one to another. A lot of the story is set at sea or on boats, or in journeying of one kind or another so for this movement to the reflected in the artwork was very effective. On the downside, I was irritated that the lead (and almost the only) female character was never allowed sufficient time to get dressed properly. Even when all the males were swathed in cosy hoods and cloaks, she was still standing around in her underwear. I suspect hypothermia was the real reason she was so easily overpowered at a potentially critical moment! Also a negative for me was that, as the first in a series, Vizilsan abruptly stops on a bit of a cliff hanger. You might already know that I hate non-endings! If I'd known this graphic novel would leave me stranded mid-story, I probably wouldn't have started it. As it is I am not sure I liked the first installment enough to risk embarking further into what could become a lengthy epic. Had to laugh about the observations on the poor female getting hypothermia. Ugh! A cliffhanger. I wish the serial stories were marked as such. Glad you got the chance to try a Serbian author and some gorgeous graphics. Goods and bads with this one. As you might have guessed, the sexism was my biggest annoyance! I have started reading graphic novels this year and I am on the lookout for new ones. But the situation with the only female lead and getting dressed would probably bother me a bit too much for me to enjoy this one completely. Such sexism! But it sounds like the story itself was okay.